I found out about this film because my friend Andrea showed me and Janie the trailer in English and we all thought that it looked amazing so I was practically counting down the days until this film came out. And now I’m really not sure what to think. The idea was pretty good and the way that the whole film was filmed on a computer screen was an interesting way to film it. I read on iMDB that originally they were filming it scene-by-scene until the actors decided to try and do the whole film in one take and the film was one of the full takes. I thought that was pretty interesting and I guess it made the film look more realistic. I also read that the film was filmed in one house and every actor was just in a different room. I don’t know, I thought all the trivia about the film was interesting. I’m not entirely sure if we were supposed to feel sorry/like any of the characters because the more I think about it, there wasn’t a single character that I liked. I guess during the film I thought there were a couple of okay characters but then by the end I realised I didn’t like any of them. Was that the point? I’ll never know. Personally, I thought the film did a good job at keeping the suspense. Maybe sometimes it was overdone. For example, she’d type out a message and sit there for about two minutes straight deciding whether or not to send it until you wanted to scream at her to just make a decision already! It was the same whenever she got a Skype call, she’d definitely take her time deciding if she wanted to accept it or not. I did like the bit where they were playing ‘never have I ever’ and I loved the tension building between the friends. Also, the scene where Blaire and Adam (I think) both got a piece of paper – which sounds completely uninteresting but if you watch it then it’s a lot better than you think. I did find it pretty scary though and that’s obviously the intention of the film so maybe overall it was a success. The last ten seconds or so did annoy me because I feel like it took away some of the scares that I had been enjoying for most of the film. I guess you’ll have to judge that for yourself though. If you’re looking to be relatively scared and want to see a new take on the horror genre then I’d recommend this film. I don’t think it’ll knock your socks off or anything though. I found this book in Waterstones when I was walking round town killing time – the blurb sounded interesting and even though I had barely any money I decided it would be a good idea to buy it. The story is told from the point of view who is Megan who doesn’t speak at all, she hasn’t spoken in months. She doesn’t care about pushing the people she cares about away – she won’t speak. Inside Megan’s head she’s screaming, screaming secrets that no one must ever find out. Then Jasmine starts at her school, a bubbly girl, talkative girl who doesn’t seem to mind that Megan doesn’t talk. Megan would love to speak to her but what if she loses everything? I’m going to be honest, I picked this up because the only people mentioned on the blurb were Jasmine and Megan and there wasn’t a love interest in sight. 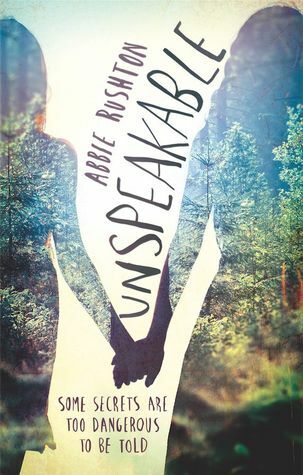 Everyone who reads my reviews regularly knows about my hatred for romance and I’m happy to say that this book didn’t follow the conventional romance found in almost every young adult book – read it for yourself to find out what I mean but I am very happy with it. The story itself was so interesting. I’ll admit that I didn’t get sucked in straight away but I was looking after my brother last night and I couldn’t put it down! I was reading for three straight hours until I’d completely finished the book. There’s an element of mystery to this book that makes you want to read until the end – Megan keeps mentioning the traumatic event that caused her to stop speaking but never goes into details and I was desperate to find out everything! I really liked Megan even though I got frustrated with her sometimes. I feel the same way about Jasmine even though so many of her decisions really annoyed me, especially some of her decisions concerning what she said or did to Megan but obviously no character is supposed to be perfect because then they’d be even more irritating. Megan’s Mum drove me up the wall but I liked her relationship with Megan, it was interesting to read about and was different to other parent relationships I’ve read. This book however was by no means perfect – after the initial shock at the ending, almost everything was brilliant except for a few unresolved issues like the bullying and a few things surrounding Megan but I can let these things go because the rest of the book was fantastic. I nearly cried towards the end and I have only ever cried at one other book before (see my Undone review…). Also, the cover of the book is so pretty! I’ve been carrying it around in the Waterstones bag it came in in case I ruin it. Honestly, I recommend this book to absolutely everyone because I loved it so much! It’s so beautifully written and gripping, I think if you’re into reading young adult books then you’ll enjoy it even if you don’t love it as much as me.